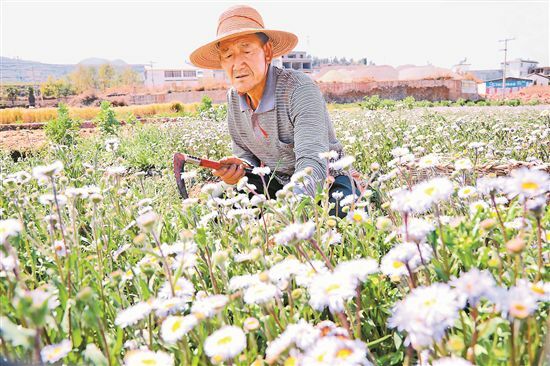 "It is cost-effective to grow Erigeron breviscapus," said Yin Yunong, a farmer from Midu County in west Yunnan’s Dali Bai Autonomous Prefecture. Erigeron breviscapus is a type of herbal medicine. Its output per acre can reach more than 60,000 yuan, according to Yin. Midu is developing the Chinese herbal medicine industry as a local new economic growth engine in recent years. It has continuously improved the technical procedure for growing high-yielding and high-quality Chinese herbal medicines, and given support to the leading enterprises in the aspects of loans, policy and technology. Up to now, the county has planted about 4,942 acres of Chinese herbal medicines such as Carthamus tinctorius L., erigeron breviscapus , paris polyphylla, and teasel root, with an annual output value of more than 200 million yuan.